How did the CLEO™ HOME Flooring obtain the Certification? This ASP:05:01 Certification Standard is targeted to flooring products that are scientifically proven to reduce exposure to asthma and allergy triggers. The Certification Standard utilizes an algorithm of proprietary and recognized scientific techniques to assess floor coverings for their ability to reduce allergenic and irritant materials. Product samples that pass certification testing are granted a certificate stating that the particular floor covering item meets the requirements for the asthma & allergy friendly® ASP:05:01 Certification Standard. Low capacity for allergen retention. Safe levels of Volatile Organic Compounds (VOCs) after installation. Manufacturer’s recommended cleaning procedures must be effective at removing accumulated allergen. Recommended cleaning procedures must not contribute to a significant increase in airborne allergen levels. During the installation and when in use, exposure to airborne solvents and other irritant or toxic materials must not exceed Certification thresholds. Congoleum then obtained the certification after their flooring product they sent for testing passed the tests and met the scientific requirements. “In order to improve indoor air quality for those with asthma and allergies, it is important to select building materials and furnishings that maintain safe levels of VOC emissions and have a low capacity to retain allergens. 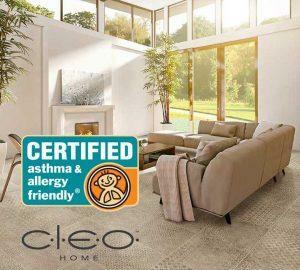 Congoleum’s CLEO™ flooring has been CERTIFIED asthma & allergy friendly® meeting all the strict requirements for our flooring standard and contributing to a healthier indoor environment.” Said Dr. Joey DeCourcey, Senior Scientific Officer at ASL. Since 1886 Congoleum Corporation has been committed to developing innovative flooring products that push the industry forward. Congoleum holds numerous patents for novel creations over the years, and these patents have resulted in products that are like no others in the industry.